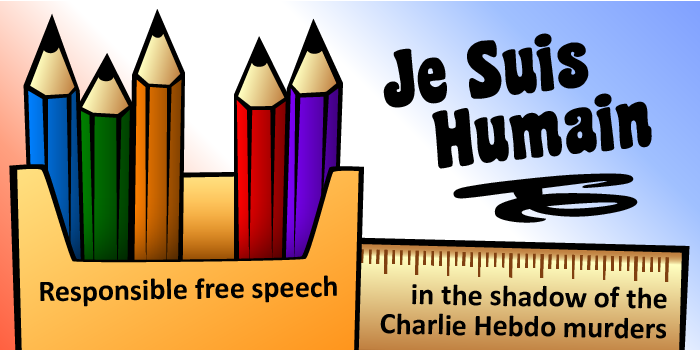 On January 20, 2015, the Online Hate Prevention Institute (OHPI) released a new report “Je Suis Humain: Responsible free speech in the shadow of Charlie Hebdo”. The report is in response to the debate raging in the mainstream and social media on free speech and its limits, if any, in the wake of the attacks in France on the satirical publication Charlie Hebdo, a police officer, and a kosher supermarket. The report gives background to the terrorist attacks, pointing out its antisemitic nature, and presents the debate on free speech within an Australian context. It also calls for amending Section 18C of the Racial Discrimination Act to include religion within its purview. Dr Andre Oboler, CEO of OHPI and the author of the report explains, “When it comes to the placement of line between freedom of speech and protection of human dignity with respect to religion, France and Australia have very different traditions.” The French tradition of Laïcité when taken to an extreme is intolerant of religion in public, whereas, Australia celebrates multiculturalism and public displays of religious diversity. “We believe that expressions of religion can legitimately be part of one’s self-identity, and should not need to be suppressed in public.” Seeking to make people feel uncomfortable and unwelcome in society because of their religion is unAustralian. The report also illustrates the difference between criticism of Islam which, like criticism of any other belief or philosophy must be permitted in a free society, and the promotion of hate against people who are Muslim, which is a form of hate speech violating basic human rights. This is done both in general and in the context of cartoons of Mohammed. “OHPI does not consider content critical of Islam as a religion or of certain Islamic practices as hate speech,” says Dr Oboler. “When people slide into generalised stereotyping of people who are Muslim, it is hate speech.” The French terror attacks have led to an explosion of hate speech against Muslims on social media, and this needs to be checked. Hate speech against Muslims includes content which: dehumanizes Muslims; stereotypes all Muslims, for example as terrorists; advocates the exclusion of Muslims from society, such as content claiming Muslims can’t be a part of society; denies human rights to Muslims; holds all Muslims responsible for the acts of extremists; or applies a double standard to Muslim communities or Muslim countries, for example making demands which would not be made of other countries in similar circumstances. Dr Oboler also noted that Section 18D would ensure that a blanket exemption for anything said reasonably and in good faith. The report also examines the response in mainstream and social media to the attacks. The mainstream media was faced by the dilemma of whether or not to republish Charlie Hebdo’s cartoons to show solidarity with them. The report strongly recommends for publications to not do so. It also recommends the use of the universal hashtag “Je Suis Humain” as against “Je Suis Charlie” , “Je Suis Ahmed” and others trending in social media to mourn the deaths of those killed. Finally, the report highlights the antisemitic aspects of the attacks in France, and the risk of rising antisemitism within parts of the Muslim community in Europe. It calls on governments and civil society organisations to tackle the problem before it leads to a wholesale breakdown of civil rights in society. The Online Hate Prevention Institute (OHPI) is Australia’s National Charity dedicated to tackling the problem of online hate including cyber-racism, cyber-bullying, online religious vilification, online misogyny, and other forms of online hate attacking individuals and groups in society. We aim to be a world leader in combating online hate and a critical partner who works with key stakeholders to improve the prevention and mitigation of online hate and the harm it causes. Ultimately, OHPI seeks to facilitate a change in online culture so that hate in all its forms becomes as socially unacceptable online as it is in “real life”.